was a short-lived (less than a year in 1927) record label. The label was owned by the Chicago Record Company, which in turn was owned by promoter Mayo Williams. 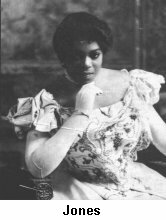 The label was named after 19th century African-American singer Sissieretta Jones, who was nicknamed The Black Patti after famous Opera star Adelina Patti. Mayo Williams had enjoyed a profitable career as de-facto manager of "Race Records" (recordings by African American artists intended for African American customers) for Paramount Records. He decided to go into the record business for himself. He had no equipment, only his Chicago office; the actual recording and pressing of the records was contracted out, mostly to the Gennett Company. "Black Patti Records" debuted with advertisements in May of 1927, with some two dozen discs said to already be available. The repertory included jazz, blues, sermons, spirituals, and vaudeville skits, most (but not quite all) by African American entertainers. A total of 55 different discs were manufactured. Williams found running his own label not as lucrative and easy as he had hoped, and closed up operations before the end of 1927. Perhaps the most famous of the sides recorded for Black Patti are those by Willie Hightower's Jazz Band.